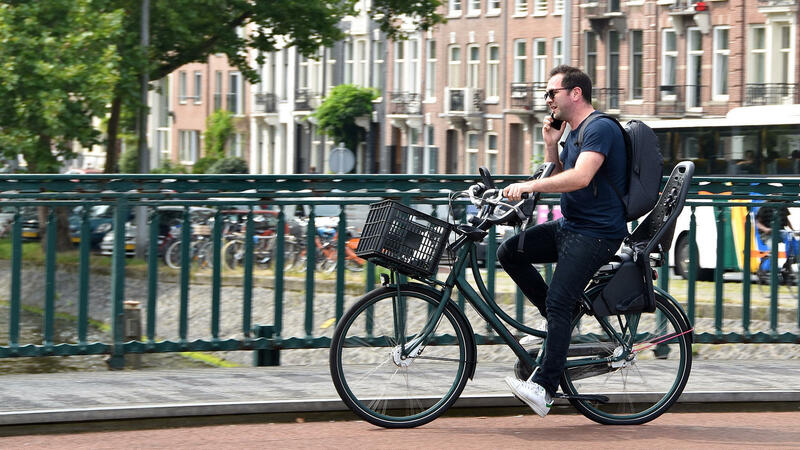 A man talks on the phone while he rides a bike in Amsterdam. Legislation proposed in the Netherlands would impose a fine on bicyclists who use a mobile phone while they're on their bikes. Biking is a widespread form of transportation in the Netherlands, and extending the telephone ban to bikes has been discussed for several years. In 2015, then-Infrastructure Minister Melanie Schultz van Haegen concluded that it would be impossible to enforce a ban on phone use on bikes, according to a 2016 story from Dutch News. But the following year, the government began reconsidering its position. "The increasing popularity of electric bikes meant cyclists' average speed had risen, the minister added, while the country's 22,000 miles of cycle lanes and paths had become more crowded." There are more bikes than people in the Netherlands, and bike rides account for more than 25 percent of all trips made by Dutch residents, according to government statistics. That is by far the highest percentage of any country, the government says. Several years ago, researchers set up cameras in The Hague and found that 20 percent of bicyclists were using phones, mostly to listen to audio, as CityLab has reported. Last year, the transport ministry said devices played a role in 20 percent of accidents involving people under 25, according to Dutch News. But as Holland Cycling notes, there is some disagreement over how directly phone use on bikes is linked to accident rates. In 2015, a teenage boy died after being hit by a car while he was looking at his phone. His father, Michael Kulkens, became an outspoken advocate for banning phone use on bikes. "The woman who killed my son is absolutely blameless and her life has been turned upside down as well," Kulkens said in 2016, as The Stack reported.
" 'I had to stop my car at the side of the road and the tears welled up in my eyes when I heard on the radio that the ban on the bike is coming,' De Telegraaf newspaper quoted [Kulkens] as saying.
" 'In my mind, I said: "We did it Tommy-Boy. We did it." ' "